Pale Moon 28.3.0, a new version of the desktop web browser, was released on January 15, 2019. The new Pale Moon version is a major release; it includes security fixes and protective features, support for new features such as AV1 for video playback, and bugfixes. Existing users may use the built-in update check to download and install the new version. Just select Pale Moon > Help > About Pale Moon, and click on Check for Updates to run a check for new versions. Pale Moon 28.3.0 should be returned so that it can be downloaded and installed on the system. The new version is available as a direct download on the project's website as well; users who run the portable version find its download listed there as well. Pale Moon 28.3.0 is a big release. It introduces new features and important fixes. The new version supports the codec Av1 for MP4/MSE videos. Support is disabled by default, however. Pale Moon users need to flip the preference media.av1.enabled on about:config to true to enable the codec. The team notes that the implementation has poor performance on resolutions of 720p and up. Another new feature displays sound indicators next to tabs and supports the toggling of sound with a click on these indicators. Pale Moon users who don't want this, for instance when they are using an extension for it, may set browser.tabs.showAudioPlayingIcon to False on about:config. The third configuration-powered change enables the processing of favicons for "optimal sized display" and "removing animations". Users need to set browser.chrome.favicons.process on about:config to true to enable the feature. The development team removed elements that are no longer required or needed. Pale Moon won't use addons.mozilla.org anymore as Mozilla removed all classic extensions from the site (Pale Moon supports classic add-ons but not WebExtensions). The new release marks the first phase of the removal of Firefox Accounts from the browser. Pale Moon 28.3.0 comes with a large number of fixes that address all sorts of issues that include potential resource leaks, potential crashes, and an update that resolves Dropbox login issues. The update introduces Defense in Depth protections that protect against potentially exploitable issues, security updates, and library updates. Pale Moon still being updated regularly is a good thing for users of the browser. The team released Basilisk in 2017 and an update in 2018. It remains to be seen how things will progress in 2019 for the two browsers. Now You: Do you use Pale Moon or Basilisk? Pale Moon 28.3.0, a new version of the desktop web browser, was released on January 15, 2019. The new Pale Moon version is a major release. I have Basilisk installed still, but hardly ever use it since it doesn’t support any addons which can change the pale grey fonts on sites to black. I’ve just looked on the Pale Moon extensions page, but can’t find one there either so there’s no point in installing it. This 28.3.0 release is brilliant by the way. I used to use that, but the dev includes expiry dates on older versions and the application now lacks some of the options which were available on those such as the ability to change the background color on sites. The menu options are there, but they don’t work, or at least not on Waterfox which I use now. But I note that the FF version now is “NoSquint Plus” by Baris Dern while the PM flavor has a different author so I’ll give it a go tomorrow. @TelV you are talking about two other, different versions of NoSquint. The one I linked is specifically updated for Pale Moon, works fine (still has a few issues) and obviously has no expiry date. The article is about Pale Moon, you mentioned you were looking at the Pale Moon extensions page, and said “but can’t find one there either so there’s no point in installing it” obviously referring to Pale Moon. That looks strange, possibly a corrupt profile, some extension or security software interfering. Never happened to me. The forums works normally now (they also did when I got your gHacks email notification). I figured it out. The error only appears if you remove the checkmark from the option to “Show search sugestions” after removing the ones you don’t want. Also, I managed to install a few addons which don’t appear in the PM library by drag&drop from the Waterfox extensions folder such as “Add to Search Bar” for example. That one allows me to add other search engines such as https://www.merriam-webster.com/ for example, or specialist translations sites such as https://www.linguee.nl/ etc. There doesn’t appear to be an option to disable WebRTC in prefs though i.e. “media.peerconnection.enabled = false” so I’ll try adding it manually later (can’t take the risk of my real IP being revealed when I’m logged into my VPN). In the unlikely event you won’t find what you need, there’s an easy guide on how to create it yourself. OK, appreciate for the tip, but at the time the errors occurred before I’d added anything at all to PM. Sorry, can’t help you there. Perhaps you are using a not fully compatible theme? I don’t use the menu bar. I enabled it temporarily and it looks ok. I don’t use it myself, but I hear NoSquint has something like that. Perhaps in some respects but Basilisk is slower than Pale Moon and slower than Waterfox too. 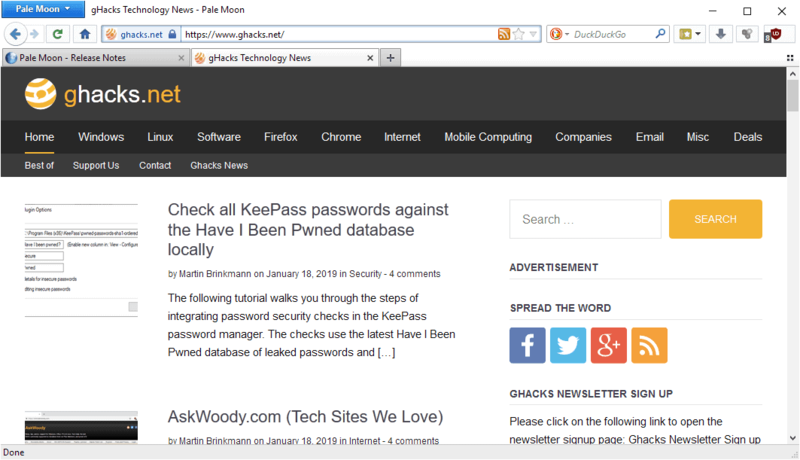 The trouble I have with Pale Moon now is the lack of password manager extensions. Enpass used to work but no longer with v6. @crambie, there’s KeePass with Auto-Type which does not require extensions and is thus safer. Sticky Password supports Pale Moon with an extension (Windows-only, both 32/64-bit, Pale Moon 32-bit only). I know Keepass/Keepassx does but I just don’t like it, I did read about a proper mac version the other day so I might try that out. I did try sticky but I’m not doing subscriptions which you need for sync. thx for the article. I didn’t read about the config options yet and haven’t seen sites using the av1 media codec. I use both of them, Pale Moon as main browser, since years now. There were some minor issues for me after previous updates, but they were fixed soon. No problems and all fine with 28.3.0 so far. Their add-ons site offers more extensions than I needed for replacing the Firefox legacy add-ons, think I only have 2 or 3 of them installed in PM. For Basilisk I use those Firefox add-ons that I luckily saved in the old days, or JustOff’s Classic Add-ons Archive (mentioned in some earlier ghacks article about legacy add-ons). When the Moon is Pale, you can cheer at it. It’s not a Fox on Fire, it doesn’t arm anyone. It just works, it is fine and honest. Some sites work, and others don’t. Stop barking at the moon and give Firefox a shot! In palemoon, I use the ublock origin obtained from the gorhill extension’s github website. (firefox-legacy-1.16.4.6). So, that may work also for other extensions if they have a repo there or on their own site. I dont use it much. The other thread about browsers add-ons turned into such a poo-fling. I presently use Waterfox as my main browser. I have it locked down pretty good. Im wary of chromium as its got Googles taint rubbed all over it. Shut down the browser ..DURING an unrecoverable download TWICE yesterday. I finally learned how to create multiple …umm… personalities in Firefox. Main one is locked down similarly to Waterfox. I even had to turn off FFx ad-blocker for this one F-ing site. I dunno if Basilisk is available for Linux, I might try it. >> I dunno if Basilisk is available for Linux, I might try it. Think Basalisk’s really Windows only. There’s an old mac build that someone did in the forum, not seen a linux build. Basilisk is released for both Windows and Linux. Pale Moon has a bigger user base and an actual project vision. And what’s the project vision exactly? Make sure that every person contributing it is insulted and threaten with lawsuit and every user who dares to have a request or comment is banned from forums? @pompoko the project vision is openly available for everyone to see in the project home page and on every release. Perhaps you’d also be able to see it if you weren’t so busy trying to make nonsensical remarks. I guess its good to move to the “new” and most have. However I am stuck in the past and very pleased. I use Palemoon 26.5 Portable, on a flash drive, and sandboxed. using great legacy firefox extensions, along with some good palemoon extensions. one i grabbed lately from palemoon is paste email 10.0 and its great to not have to type in my long email address anymore. this old palemoon version is great for grabbing video and after three years of it absolutely no problems being portable. new is pretty good after its been tested and checked and used by others for some time. So far no issues with the new version. Works here on my Windows 8 machine quite flawless. I upgraded to Palemoon 28.3 on my old laptop (which runs 32-bit Mint 19.1) and the preferences dialog is broken again. I can display the dialog, but none of the controls on it respond to mouse clicks. The dialog works fine on my desktop PC running 64-bit Mint 19.1. This also happened in an earlier update which was subsequently fixed, so I guess the fix was not merged into the baseline for 28.3. @Peterc It’s an HP dv5133ea that I bought it in 2006. It has a 32-bit processor and only 2GB of RAM. It’s on its 3rd battery and I keep thinking I will replace it when the battery will no longer charge, but it just keeps on going! It’s only really used for web browsing. Some busy web pages stress the cpu a bit, causing the fan to get rather noisy, and there are a couple of marks on the screen but, apart from that, it does its job ok.
I’m back to Pale Moon since 2018 Firefox Quantum. Pale Moon looks like I want to see, without Firefox changes I wanted not. 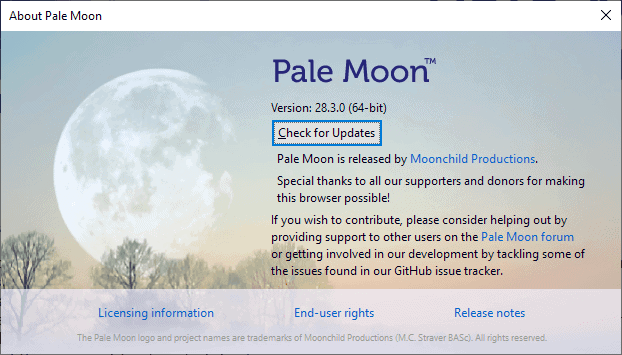 Well, Pale Moon 28.4.0 is out – apparently a major release. I’m keeping tracking on what’s going on there at the Moon Factory. If Quantum’s changes keep happening at the current pace, then by the time my ESR v60 release is EOL, I may not like what Quantum has turned into!